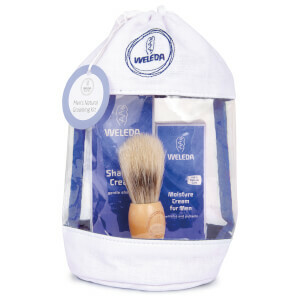 Create ultra-soft, smooth skin with the Weleda Men's Grooming Kit, containing a trio of products that help you to achieve the perfect shave and a healthy, youthful-looking complexion. Housed within a branded wash bag. Free from synthetic colours and fragrances. Ideal for replenishing your skin during the day or in the evening, this light cream is easily absorbed and ensures your skin is kept smooth, hydrated and protected. Suitable for sensitive skin, the moisturiser quickly penetrates the skin so that it becomes elastic, smooth and supple. Carefully selected essential oils moisturise, refresh and protect the skin leaving you feeling revitalised. Based on pure Vegetable Soap and natural oils the cream produces a smooth lather giving you a gentle yet thorough wet shave. Containing extract of organic Pansy known for its soothing and healing properties, the shaving cream helps soften the skin and soothe the minor cuts and scrapes caused by shaving. Sweet Almond Milk and organic Goat’s Milk provide the foundation of this subtly fragranced cream to provide a smooth, irritation free shave. Moisture Cream: Apply morning and evening to shaved skin on the face and neck and gently massage in. Use as required during the day to refresh the skin. Use only as much cream as the skin can easily absorb. Shaving Cream: Wet the face with lukewarm water. Apply a pea-size amount to one finger tip, spread over finger tips with finger tips of other hand. Massage lightly, but briskly, into the area to be shaved. Shave as normal. Moisture Cream: Water (Aqua), Simmondsia Chinensis (Jojoba) Seed Oil, Sesamum Indicum (Sesame) Seed Oil, Alcohol, Hamamelis Virginiana (Witch Hazel) Distillate, Glycerin, Glyceryl Oleate, Hydrolyzed Beeswax, Magnesium Aluminum Silicate), Althaea Officinalis Root Extract, Xanthan Gum, Beeswax (Cera Flava), Copernica Cerifera (Carnauba) Wax, Sodium Beeswax, Chondrus Crispus (Carrageenan), Fragrance (Parfum)*, Limonene*, Linalool*, Benzyl Benzoate*, Geraniol*, Citral*, Coumarine*, Farnesol*. Shaving Cream: Water (Aqua), Potassium Stearate, Glycerin, Potassium Olivate, Potassium Cocoate, Sodium Stearate, Fragrance (Parfum)* Viola Tricolor Extract, Prunus Amygdalus Dulcis (Sweet Almond) Fruit Extract, Caprae Lac (Goat Milk), Sodium Olivate, Sodium Cocoate, Sodium Silicate, Magnesium Sulphate, Alcohol, Limonene*, Linalool*, Citronellol*, Geraniol*.